India, for long has been a land of Mystics and Yogis who deeply understand the nature of spirit and how all is connected in this infinite space of creation. 'Mystic India' is a documentary film on the life of Neelkanth (A name for Shiva), a young 11 year old Yogi who set out on his journey to awakening, embracing the extremities of nature. From 1792 to 1799, Neelkanth walked alone, barefoot and barebody, 8000 miles for 7 years through the length and breadth of India. Carrying no maps, no food and no clothing, how he crossed the roaring rivers, faced ferocious animals and survived the freezing winter of the Himalayas, is still a mystery. It is a story of perseverance, of kindness and of courage even when face to face with a man-eating lion. Mystic India takes you through icy peaks to the cool blue Lake Mansarovar, into the wild jungles of Sunderbans and the rain forests of Assam, through barren deserts and to the silent shores of South India. Explore and learn from the majesty and mysticism of India's art and architecture, music and dance, faces and festivals, customs and costumes which are brought to life on the giant screen. 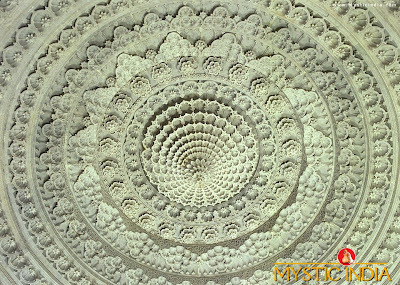 Mystic India rediscovers India, a land of many mysteries and fascinations, the one land that all desire to see. Home of the Himalayas, the tallest mountains, India is our world's largest and oldest democracy, and contains an amazing wealth of wisdom, culture and spirituality. And within this earliest civilization known to mankind, lie hidden mystical secrets. It lies hidden in India’s silent spirituality, making her a mystic land of meditation, contemplation and enlightenment. Thanks to our friend Sandeep Dinker, The Highway Star we got to see the movie at Prasadz IMAX ... Truly Inspirational ! 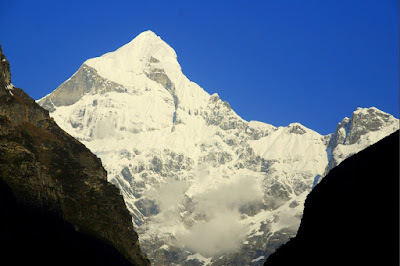 The picture above is of the Neelkanth Peak towering over Badrinath, also known as 'The Garhwal Queen' ! At first glance the face of the peak resembles the head of Ganesha. For more mystical adventures riding around the magical land called India please visit MysticXpressions !